Palawan has been voted the most beautiful island in the world, and for good reason. With its plethora of crystal clear turquoise waters, stunning lagoons, and plunging cliff lines, its not hard to see why. Palawan is the epitome of the word paradise. There’s a lot you can do and see on Palawan even with a limited timeframe. I spent a week in Palawan, split between El Nido and Coron and it was the perfect introduction to the Philippines. To make it simple, it’s going to take a long time! There are no direct international flights to El Nido so you will have to fly to Manila first, and then either fly to Puerto Princesa and take a 6-8 hour van ride up to El Nido. Or there is the more direct (and more expensive) option of flying nonstop to El Nido. I flew with Air Swift on a short flight from Manila and it cost me $130. To me the direct flight was worth it to get there quicker. You’ll be greeted at El Nido airport with a serenade from the local Filipino women, a unique welcome to the Philippines! Air Swift passengers are also given free coffee, juice and snacks upon arrival. To get to your accommodation, you’ll most likely have to take a tricycle, which reminds me of a mini tuk tuk. It costs 300 PHP to get to town (around $6) and takes around 15-20 minutes. People flock to El Nido for the famous island hopping tours. There are 4 main tours leaving from El Nido: Tour A,B, C, and D. Creative, huh? They also offer combined tours if you’re super short on time (but some of the stops are cut out obviously). Tour A & C are the most popular and most the pictures you’ve seen from El Nido are most likely from those tours. If you had to pick just one, hands down I would choose Tour A! All the tours are a fixed price by the government so don’t bother trying to negotiate. There are dozens upon dozens of tour companies in town and they pretty much all offer the same tour with the same stops so no need to be extra picky on this one. I am one for good reviews so booking online beforehand wouldn’t be a bad option either. Rent a motorbike for 300-500 PHP and drive 45 minutes North to Nacpan Beach. The last 20 minutes is super bumpy and rocky and it’s uncomfortable but not dangerous. There’s a little restaurant that serves fresh seafood and drinks on the beach. Unfortunately, Twin Beach was closed due to a court case involving squatter activity until further notice so it’s impossible to get that infamous view of Twin Beach. This was the best I could do from the bottom of the hill. You can kinda see both beaches, but not so epically. Meh. Take a tricycle to Las Cabanas. It will cost 150 PHP from town and takes less than 10 minutes. Las Cabanas is a great place to relax and unwind from the day, and have a drink if you’d like. There are a few cafes right on the beach and it’s a very popular place to catch the sunset. Meremgmeg Beach Bar was really cool and had swings at the bar instead of seats. Take Tour A, the post popular (and my favorite) of the tours. The tour will take you on 5 stops including: Small Lagoon, Big Lagoon, Simizu Beach (lunch stop), Secret Lagoon, and 7 Commandos Beach. You can’t swim in this gorgeous lagoon. The boat takes you in and you just sit back and enjoy turquoise waters like you have never seen before. You can rent a kayak (Depending on availability) or snorkel and explore the big lagoon, which was so much fun! The Secret Lagoon was unreal in terms of beauty. We had to jump off the boat and swim here from a distance where we could explore the hidden lagoons and caves. This is exactly what I imagined the Philippines to be. The last stop of the day is on this long white sand beach. They have a bar and souvenir shop, as well as comfort rooms (what they call restrooms in the Philippines). There is also a fun rope swing that you can play with! I booked Tour C with Art Cafe. The buffet BBQ lunch they served was really good! The tour leaves at 9am and comes back around 5pm. Cost: 1400 PHP plus 100 PHP to rent fins (snorkel masks are already included). 5 stops are included on this tour including: Hidden Beach, Secret Beach, Starfish Beach, Miniloc Shrine, and Helicopter Beach. I found absolute paradise in Hidden Beach. I kinda wanted them to leave me there “accidentally”. The Miniloc Shrine had the best viewpoint over the islands (cost is 100 PHP to go here). There are very pointy rocks at the top so please be careful. This is guaranteed to be one of the most risky hikes you will ever do. Do NOT attempt to do this hike without a guide, it’s quite dangerous (and I don’t say this often). You’ll be stepping on jagged, pointy, super sharp rocks and at some points you will be climbing up a 90 degree angle! It’s honestly more like rock climbing than a hike. Except that you will have NO harness or protective ear. But the 180 degree panoramic view at the top is worth all the fright and agony getting up there, trust me! You can go in a group or hire a private guide. The whole trip takes about 2.5 to 3hrs. It costs 500 PHP for one person and can be as low as 300 PHP if you get a few people to go. Take a sweat rag. I was dripping sweat and was all slippery. Not cool when my guide reached for my arm to pull me up in some places. Start as early in the morning as possible to beat the heat. I really wish I had brought gloves because the rocks I had to pull myself up on were super sharp. Make sure to bring sturdy shoes (they won’t even let you hike without closed-toe shoes), water, and snacks. Don’t bring many items with you. You do not want a big backpack on your back when you’re doing this climb. My guide actually didn’t let me carry a bag and put my stuff in his backpack. Make sure to grab the rocks with your hands before moving with your feet. On the way down go backwards, it’s easier and safer. Rent a kayak for 400 PHP and paddle over to Bikal Beach on Cadlao Island. There is a small and secluded crescent shaped beach which takes about 45 minutes to 1 hour to get to. You’ll most likely have the beach to yourself. Unless you go in the morning because I believe tour D makes its first stop here. Wouldn’t you love to have a whole stunning beach to yourself? Get a massage to end your trip in El Nido. It costs about 500-600 PHP per hour for a full body massage and you can find these massage shops all over the city. I got a head and food massage to end my day and it was just perfect after all that hiking and kayaking I had done. There’s a newer fast boat option by Montenegro Lines that leaves daily from El Nido at 6am and from Coron at 12pm. The journey supposedly takes 3.5 hours (it took about 4 hours and 45 minutes) and is pretty comfortable in a clean and air conditioned boat. They play a movie on the flat screen during the trip. I booked my ticket online through Naturalis. Make sure to arrive to the port 30 minutes early to check-in and pay your port fee (20 PHP) before you can board. You can pick your seat when you check in so if you’re prone to sea sickness, make sure to pick a seat in the back of the boat. Cost: 1848 PHP + 20 PHP port fee (about $36 USD). If you want to save a few dollars there is a slower ferry option on a freight ship that takes 7+ hours. I heard it’s extremely uncomfortable and the boats are older and less clean. Just google it if you want to make your decision easier. It’s literally less than a $10 difference so why put yourself through that hell? Take the fast boat! There isn’t much to do in Coron town honestly. It was a stark contrast to the lively El Nido, so just take the afternoon to relax before the evening activities. Head to Coffee Kong, for some good coffee. It’s a cute little coffee hangout and the only place I found with soy milk! They also serve breakfast and have really good Air Con. You have to walk 700 steps to get to the top of Mt. Tapyas, but it’s well worth it. It will take you about 25-30 minutes to walk to the top. How it works is you hire a tricycle to take you there, they wait for you, and then they take you to Maquinit Springs (which is 20 minutes away). The entire ride only costs 300 PHP (~$5) and I was with my driver for about 4 hours. Maquinit Springs is a huge natural saltwater hot spring surrounded by mangroves in the jungle. It’s a super unique setting and although it’s quite busy, it’s still very relaxing. I must say these were the hottest hot springs I have ever experienced. Have you ever noticed that most hot springs are warm, but not very hot? Not this one! It’s super hot and exactly what your body needs after that hike up Mt. Tapyas. I booked with with JY Tours as it was recommended by my Airbnb host. Stops included: Malcapula Beach, CYC Beach, and Waling Waling Island. A heavenly white sand beach and crystal blue waters. It’s one of the prettiest beaches I saw in the Philippines. Hiked up the little hill for this secret view. CYC is the only remaining public beach in Coron. Compared to all the other beauty I saw in the Philippines, this beach was pretty run down, crowded, and dirty. Our group was wondering why they even had this stop on the tour. No pictures here because there wasn’t much to see. Locals refer to this beach as the mini Maldives due to the crystal waters. It was my favorite stop of the day! During low tide, a sand bar appears and you can walk out onto it. It is breathtaking. Completely unedited iPhone shot of the gorgeous Waling Waling island. There was another stop on our itinerary but our guide chose to go here instead…which none of us were complaining about! Stops included: Twin Lagoon, Kayanga Lake, Skeleton Wreck, Bamboo Beach, and Siete Pecados. Cost: 1500 PHP (~$29). I also went with JY tours for this one as well. A stunning lagoon where you can swim under the rocks (or walk up steps) to get to the more hidden lagoon. This is the view entering the area of the Twin Lagoon. This was shot on a moving boat with my iPhone and I did NOT edit it at all. This white sand beach was lined with mangroves and had no one else in sight. This is also where we had our peaceful lunch stop. Kayanga Lake crystal clear lake known as the cleanest lake in the Philippines and some also say the cleanest lake in Asia. The “money shot” of Coron you will see if you google “Palawan”. This view is on the walk up to Kayanga Lake. You can dive (or snorkel) to see Skeleton Shipwreck where you can see the skeleton of a sunken Japanese ship. This is what you will see above the shipwreck. How amazing is this water? There are also many bright tropical fish around the area. Can you see the sunken ship? It would have been fun to scuba dive down inside of it! Wifi connection is very poor in the Philippines, so staying connected was not the easiest. I used a combination of a local SIM and my Skyroam portable hotspot device to stay connected. You can get a local SIM for 600 PHP ($12) for 4GB plus 1 free GB (5gb) with Global SIM at the airport kiosk. The plan lasts 30 days. Accommodations in Palawan were more expensive than I imagined they would be in the Philippines. I spent about $30 per night. When I travel I usually spend on average $25 per night to rent a room (more if I rent out a whole apartment). But the value for the price in Palawan was not that good and the standards were a lot lower than I expected for that price. That being said, go in knowing what to expect! I stayed in Airbnbs in both Coron and El Nido. While I cannot recommend the place I stayed in El Nido, the room I rented in Coron was very large, clean, and had good Air Con. The host is from California and was really laid back and helpful. It was in a convenient location and was pretty comfortable. You can check out the listing here. Have You Been to Palawan? Is there Anywhere Else you Would Recommend to Visit that I Missed? After your 7 days how did you get back to Manila to catch outgoing flight? We have a week to spend in the Philippines in April and your itinerary looks perfect, but I need to return to Manila to catch next flight to Bangkok. Thanks! we have planned for a trip to palawan in coming July 1st week, but i am just curious to know about the weather as i read about the typhoons during wet season in Philippines. Is it gonna be a bad idea travelling in July? when was these pictures taken and how was the weather? was it raining?? Hi! This was in early May and the weather was pretty good the whole time! It only rained one day for a few hours if I remember correctly. I’m not sure about July, you’ll have to do some research on that on your own :). Good luck! Thanks for the itinerary! 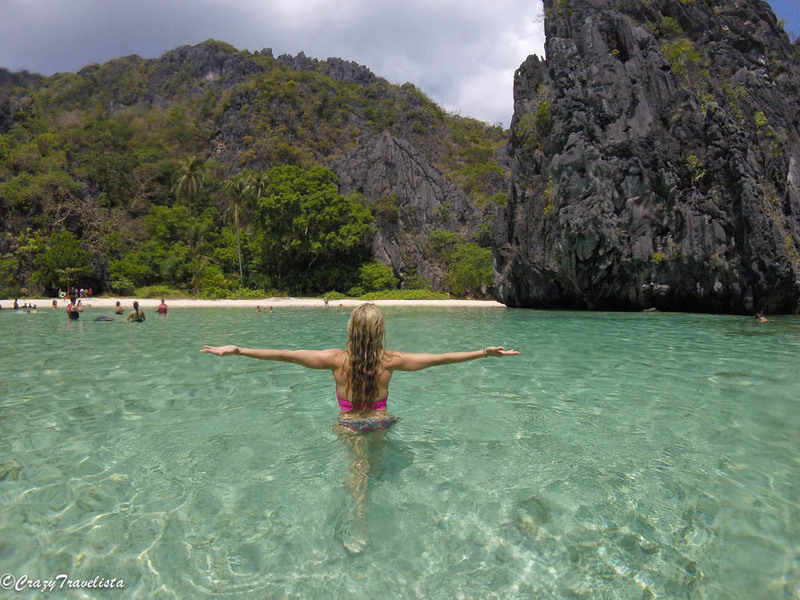 But wondering why you could not swim in the small lagoon in El Nido? Was your tour short on time? What tour company did you use for that tour? Hi! I’m not exactly why they didn’t let us swim in the small lagoon. they didnt tell us why. But I didnt see anyone else swimming in there either so maybe its regulated? I just randomly found a company in El Nido for tour A. There are SO many tour companies and like i mentioned, the price is regulated by the gov’t so I wasn’t too picky on which company to pick. When I was searching for companies online, I didn’t notice any with bad rating so i decided to just pick one and it turned out great! Two girlfriends & I are planning a Palawan escape next year to celebrate our 50th birthdays & over 30 years of friendship. (We went to Fiji for our 40ths). Thanks for such a detailed helpful blog. It has provided us with lots of great info & inspiration to start planning. Husbands & kids will be very jealous lol! Oh awesome, glad I could help! That’s awesome that you girls have stayed friends for that long! That definitely calls for a big celebration! Have so much fun! I have been looking for a quick way from Coron to El Nido for weeks! We almost considered not going to El Nido since it was such a hassle to get to! Thank you! Thanks! Ya its clear to see why Palawan has been named the most beautiful island in the world. I couldn’t believe my eyes! It is breathtaking for sure! Thanks! Yessss Palawan was amazing!!! The water and beaches were other worldly!! Haha ya that hike was nooooo joke!!! But you’re right. It was the perfect mix of action plus relaxation!